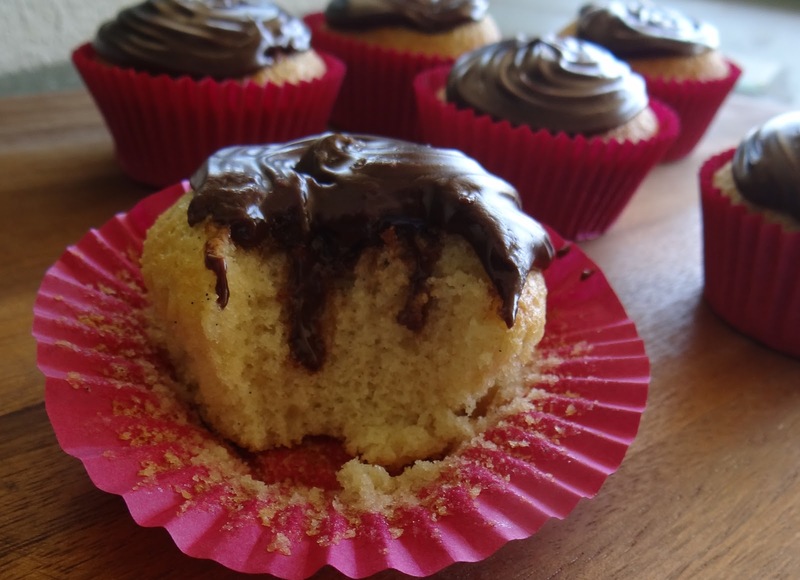 Words & Cake | Bake, Eat, Write, Read: Vanilla Cupcakes with Nutella Chocolate Ganache + 1 month! Vanilla Cupcakes with Nutella Chocolate Ganache + 1 month! I made cupcakes. For no reason in particular. Well, no, okay. Not no reason. I have officially kept this blog for 1 month! And while this seems like a really tiny thing, no big deal at all to most people, it's a major thing for me because usually by this point in time in my history of 'let's-start-something-new!' I would have gotten bored/gave up/moved on to other things. I have about six diaries started at different points in my life that have only been written in for two pages, a scrapbook that only has one photo in it and countless online accounts for a million different sites that I have signed up for, logged on once, then never revisited again. What can I say? I've got a short attention span. It's a problem, yes. So. I decided to make cupcakes for a little mini-celebration of having kept an online food blog for a month to share with my invisible internet readers. I am a little worried about myself too. But can we just talk about these cupcakes for a second? They've been gradually forming in my mind for the past week. First I wanted chocolate cupcakes. Then I decided that no, actually, vanilla would be better - made with vanilla bean paste to get that lovely speckled vanilla seed effect. Baked with oil, to give myself the illusion that it's healthy. I was going to go with a nutella buttercream, because I'm a nut for nutella (see what I did there?). But then I realized I had no butter in the house and I was too lazy to go and buy some. Switch to dark chocolate ganache. Ooh, wait, what about nutella dark chocolate ganache? So at the end of that stream of consciousness (which I don't blame you if you completely skipped over), this was the final product: vanilla cupcakes with nutella chocolate ganache and just a little sprinkling of sea salt. And really, there's not much more to say except they're every bit as awesome as they sound. I'm not much of a cupcake person, but I loved these - they're not overly sweet like a lot of cupcakes are, and you can add as much/little of the ganache as you like. It can be made (relatively) quickly as well, all things considered, these cupcakes can be baked, cooled and frosted in 45 minutes. And to top it all off, there's not a gram of butter in sight. Pretty good, right? And, well, okay - the blog thing was just an excuse. You really don't need a reason to make these cupcakes. At all. Or I mean, 'it's Wednesday' is probably just as good an excuse as any. Note: okay, here's the thing. I halved the original recipe but I forgot to halve the eggs, which I honestly didn't realize until I started writing this recipe out in this post. If halved correctly, it should be 1 egg - but I added 2 and the recipe worked well, so that's what I'm keeping. If you try it with just 1, let me know how it turns out! Preheat oven to 180C/350F degrees and line your cupcake tin. In another small bowl, add the vinegar to the milk and set aside for 3-5 minutes. In a large bowl, add the eggs and whisk until frothy. Add the sugar to the eggs and whisk vigorously for about a minute. Add the vanilla and oil and whisk until incorporated. Add half the flour, mix, then add half the milk and mix. Repeat with the rest until everything is well combined. Pour the cupcake batter into the cupcake liners about 2/3 full. Bake for 12-15 minutes or until a skewer comes out clean. Cool the cupcakes completely on a wire rack before frosting. If cupcakes are too domed, you can use a knife and cut off the tops for easier frosting. Note: the nutella isn't very strong here, it's more of a subtle hazelnut-chocolate flavor that you get. If you'd like it to be stronger you can try adding 1/4 cup more nutella, keep in mind that will also make it sweeter. Also, you will have leftover ganache with this recipe. Halving it would probably be enough for 6 cupcakes, or else you can save the leftover frosting for other cookies, cakes etc. Or just eat it with a spoon. I don't judge. Put the chocolate into a bowl. Heat the cream over a medium heat until it starts it simmer; take it off and pour immediately over the chocolate pieces. Leave it alone for about 5 minutes to let the chocolate melt, then using a whisk beat the mixture until smooth. If you find that there are chunky bits of stubborn chocolate just pop the bowl in the microwave for 10 second increments until you get a smooth mixture. Whisk in the nutella. Put the bowl in the fridge to chill for 5-10 minutes until it thickens. Once the mixture is chilled, add the icing sugar and beat with an electric mixer until fluffy (be careful you don't over-beat, otherwise it will split). Put into a piping bag and frost your cupcakes, or spread using an offset spatula. Top with a pinch of sea salt on each cupcake and serve.